Want to know how people are finding your site, which blog posts are most popular, or how many of your visitors are using mobile devices? All of that and more can be easily found out using Google Analytics and MonsterInsights. In this article, we’ll show you how to set up your Google Analytics account and install it on your WordPress site using MonsterInsights. 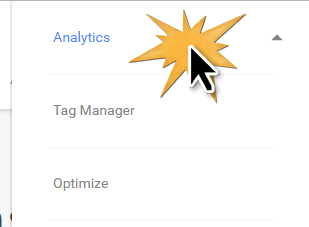 Then click Analytics at the top of the dropdown menu that appears. 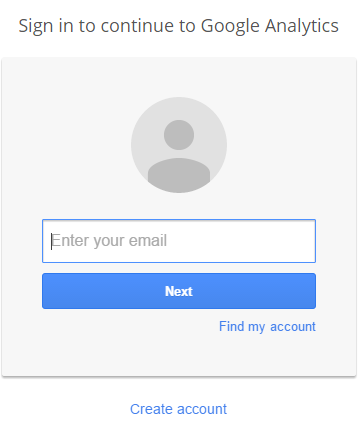 After you’ve signed in to your Google account, you’ll need to sign up for Google Analytics. Click the Sign Up button on the right side of the page to get started. 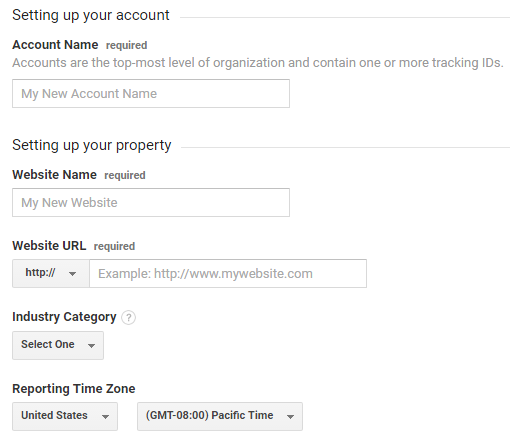 Next you’ll need to enter the settings for the site you want to start tracking. Make sure the Website option is selected at the top. Then you can scroll down to enter your website information. You’ll need to name your Google Analytics account, and enter your website name, URL, and industry, as well as your time zone. 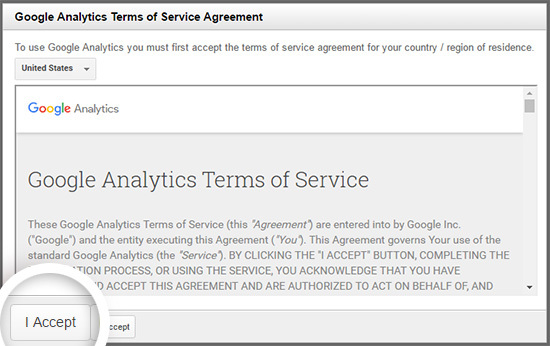 In the popup window that appears, you can review and accept the terms of service. That’s it! 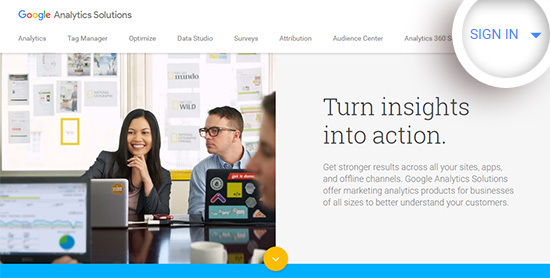 You’re now signed up for Google Analytics. Normally, you’d have to insert your Google Analytics tracking code into your WordPress website’s code. But with MonsterInsights, you don’t need to worry about using any code. Instead, you can get started by downloading the MonsterInsights plugin. To do that, you’ll need to login to your MonsterInsights account and download the plugin zip file. On the next screen, you can click the Choose File button to select the zip file you just downloaded. Then click the Install Now button to upload the file and install the plugin on your site. Once the plugin has been uploaded and installed, you can click the Activate Plugin button to activate it on your site. Next, allow MonsterInsights the proper permissions. Finally, select the profile for your website, click the I’m not a robot checkbox, and then click Complete Authentication. 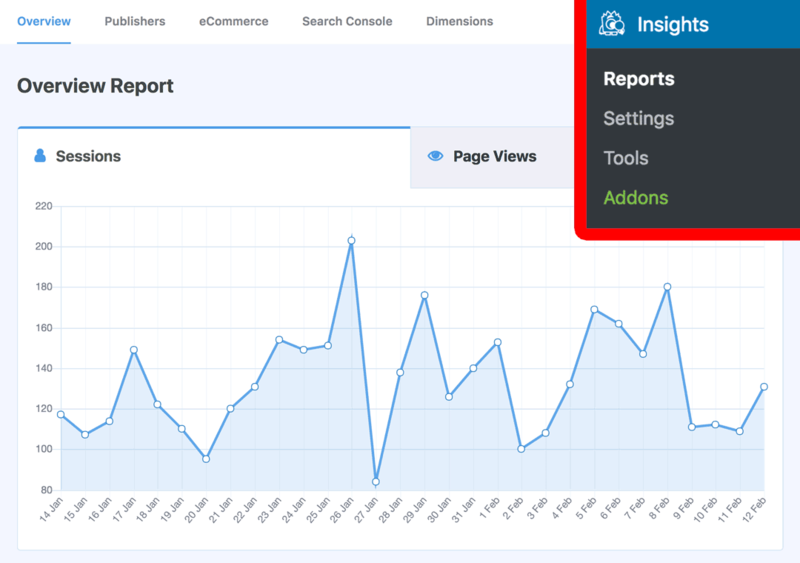 Once it does, you can go to Insights » Reports to see how your site is doing. We hope this tutorial helped you to set up Google Analytics with MonsterInsights. If you liked this article, then please follow us on Twitter and Facebook for more free tutorials. Excellent! Easy to follow instructions—even for technically inept people like me. Thanks for posting this; it was really helpful! Thank you, Candy! Glad you found it helpful 🙂 Feel free to check out WPBeginner for more beginner-friendly WordPress tutorials! Excited try this, but at the last step it won’t let me select my website. It’ll only let me select the alternative which is All Web Site….. I just try this plugin and setup very well in my website by reading this tutorial. It is really useful and working correctly. I really appreciate this very complete step-by-step explanation…unusual to get something this good…thank you. Thanks so much, Christian! Glad you found it useful 🙂 If you like, you can follow us on Twitter and Facebook for more step-by-step tutorials. Do i need to manually add google analytics tracking code script to my wordpress site ? Hi Dilan! Nope, if you follow this tutorial and use MonsterInsights, there’s no need to manually add the tracking code. MonsterInsights handles all that for you, so there’s no need to touch any code. What happens if you already have GA tracking code implemented on your site? Do you need to remove it? If so, do you lose your historical data? Yes you’ll want to remove it. 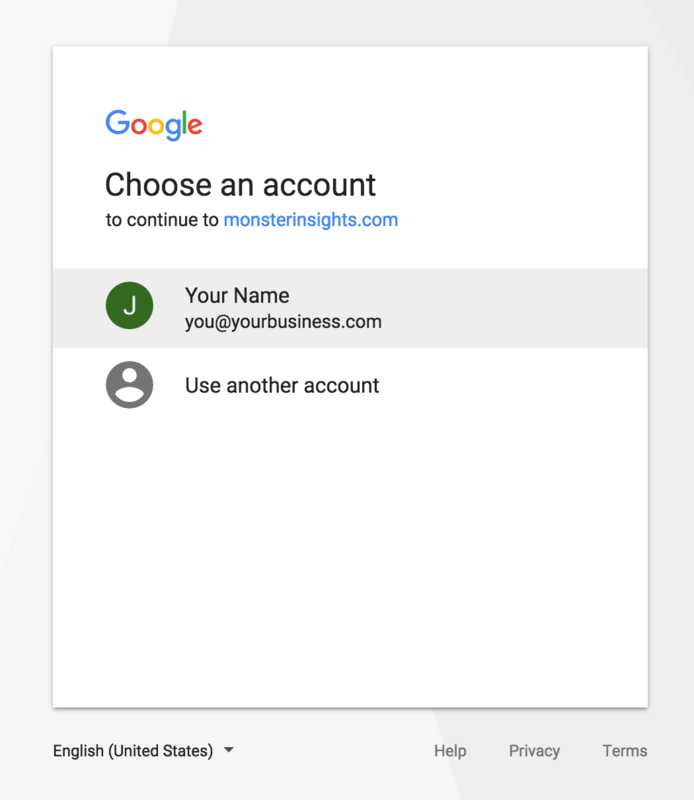 Your historical data is tied to your Google Analytics profile not the actual tracking code, so MonsterInsights will be reporting it’s Google Analytics data into the same place. Thus your historical data will be just fine, and from the point of view of Google Analytics’s reports, the newly collected data will go to the same place as your “historical” data, so on reports like session count it will appear as if nothing changed; the biggest change you will notice is you will be able to get more reporting out of Google, for example in the Top Events area we’ll start adding the outbound link click events (if you have that feature turned on) for example. Thanks for the explanation, but I still have one concern, if you can help me out. After we successfully set up your plugin, can we normally add new pages on our website? I mean, is the tracking code automatically inserted in all pages that we create after we installed MI plugin? 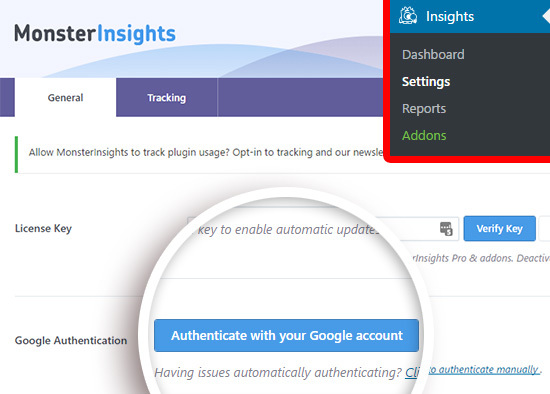 MonsterInsights automatically outputs the tracking code on all pages/posts created before and after install of the plugin. And just one question. We have installed the code with MI plugin last week, and I thought that it worked normally. But now I see that we still can’t see age and gender reports. I clicked and confirmed all the needed things in property settings, but still nothing. In the code there is “displayfeatures” line, can this be the reason? I read that this line is not necessary anymore since it can just be toggled in property settings. Any help? To track more information of your visitors like gender and age, you’ll need to enable demographics and interests report in Google Analytics. If I already have Google Analytics setup on my website and am using another plugin for e-commerce tracking, can I just uninstall those plugins and install yours? Of course! Make sure to remove other Analytics plugin while using MonsterInsights. Otherwise, Analytics may double track your traffic. You should also try our eCommerce addon, which gives you all the data you need to optimize your eCommerce store for conversions. 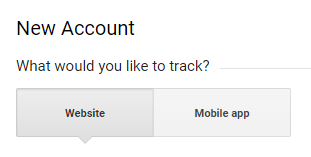 If I use your plugin to acquire the tracking code, who owns the google tracking code? Would I have access to the data accumulated to that traffic code (on the google analytics website) if for any reason I choose to delete the plugin? Or would I only have access to the data through my WP dashboard, and only as long as I have your plugin active and installed? Thanks for your interest in MonsterInsights and letting us know your concerns. 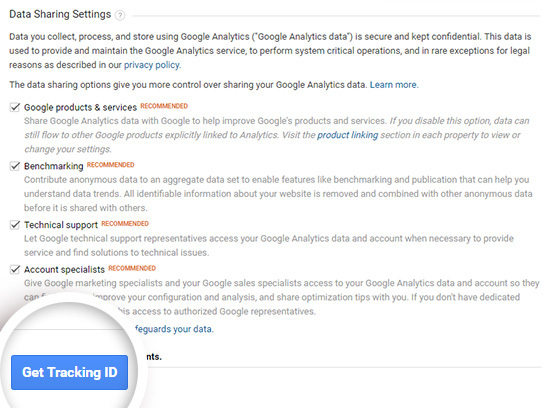 If you decide to uninstall the plugin in future, you can still access your previous tracking data in Google Analytics. It won’t disappear. If you want, you can then set up Analytics natively and continue tracking your site without any issues. But you’ll definitely miss the cool tracking features MonsterInsights provides. I guess it took about 15 minutes before the code started to appear in the source code. It seems to be working now. Thanks for a great plugin guys! Happy to see that you liked the plugin. Thanks! I am setting Monster Insights up for a client now and would like to know what I need the client to do on his end in order for me to authenticate the account. I have full access to the WordPress dashboard but not his GA account. My administrator has installed MI on my Word Press website and I have set up Google Analytics and authenticated MI with my Google Account. If you haven’t already you’ll want to turn on tracking for outbound links in MonsterInsights. Then you can view the results in Google Analytics following this guide if you’re a Lite user, and if you’re a Plus or Pro level MonsterInsights user, you can view the top links on on the brand new reporting dashboard for paid MonsterInsights users inside of WordPress on the Publisher Report. I’m trying to authenticate my monsterinsight but the popup at authentication doesn’t show the lower buttons (cancel and next, hence I’m stuck.